Sunday, November 24th, 2019 at 4 pm in the garden of the Jared Coffin House with a reception following at Dune. Each year, on the Sunday before Thanksgiving, Palliative & Supportive Care of Nantucket hosts its Annual Tree of Remembrance Service. 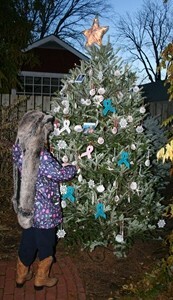 Gathering at our memorial tree, donated by the Stout Family, in the garden of the Jared Coffin House, community members come together to remember loved ones who’ve died, and add ornaments with their names to the Tree of Remembrance. A brief interfaith service is held, followed by a warm reception indoors. 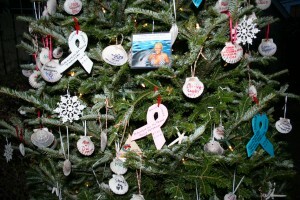 Scallop shells are provided for names of loved ones, or participants bring their own ornaments if they wish. The ornaments remain on the tree until the first of January, at which time they’re removed and the shells are returned to the ocean. This has been a simple but poignant service every year, held at the beginning of the traditional family holiday season, and provides families with a time to acknowledge and remember loved ones who are no longer with them. Coming together in community not only honors those who’ve died, but supports those who remember them. A warm reception follows at Dune. Special thanks to Michael Getter of Dune who hosts a warm reception each year, to Rev. Gary Klingsporn and Rev. Linda Simmons for leading the ceremony, and to the Flanagan family, Mollie Glazer, and Jessica Sanseverino who have graced us with their voices over the years.